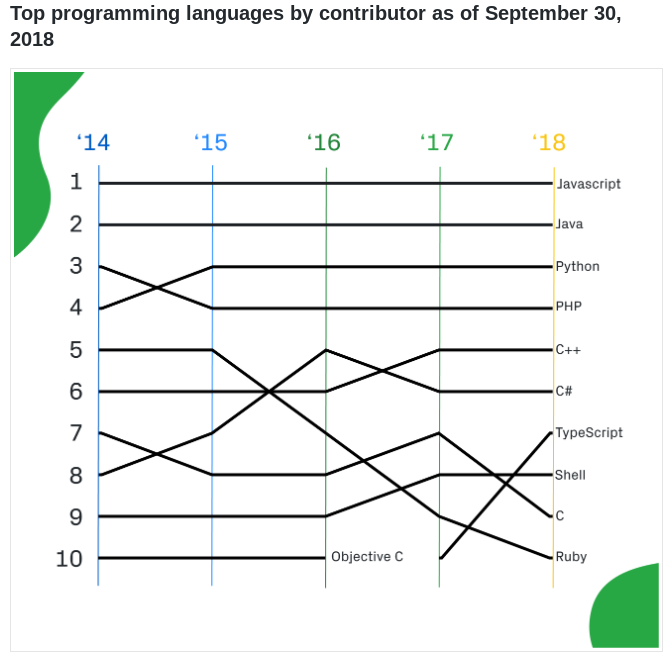 Last month, we highlighted an article in TechCrunch that noted the various faults with modern language ranking attempts, asking “What the heck is going on with measures of programming language popularity?” The article went on to pick apart both the TIOBE Index and the rival “PYPL Index” before settling on GitHub’s annual reports, which it declared “basically a perfect match for [the author’s] own experience,” with the only caveat being that they would account only for open source projects. 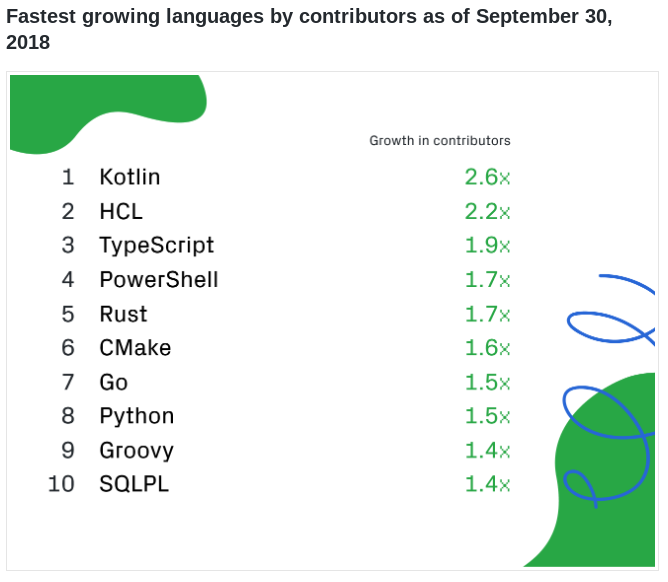 Of all the language ranking attempts out there, I also find myself most drawn to those based on GitHub’s numbers, though fault could easily be found with any singular attempt. I, too, was once a college student taking classes like “Statistical Analysis” and “Research Methods” and know only too well how basically every way of observing phenomena not only involves shaping that phenomena but also comes with a number of inherent flaws based on whatever method of observation you might choose. In this chart, of course, we see that Ruby is on a steady decline, while Typescript is on a steady rise. The only surprise to be seen here is that C, after a brief uptick in popularity, has taken a bit of a nosedive over the past year. Either way, seven of 10 languages have the same exact ranking. It would seem, at least for now, that language popularity has leveled off. Of course, that’s not to account for all those also-rans in the periphery that are clawing their way up the charts. Finally, beyond the language rankings themselves, GitHub offers a wonderful analysis of just what it is that makes a particular language popular in 2018, boiling it down to three key characteristics: thread safety, interoperability, and being open source. Take from it what you will and, in the meantime, check out this wonderful video that succinctly explains how computers count things that are very difficult to count. 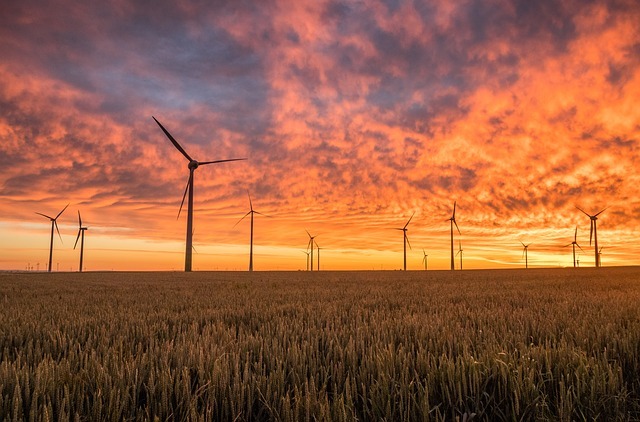 Visual Studio 2019 and Visual Studio Code October 2018: Microsoft offered both a preview of the changes coming in Visual Studio 2019 and an update on the October 2018 release of Visual Studio Code. As for Visual Studio 2019, SD Times writes that the company is “updating the theme, icon and splash screens as well as providing new ways for developers to get to their code faster,” in an update that was first announced in June of this year. Highlights of the release will include “a new start window to provide fast access to common actions” and “a new streamlined Git-first workflow,” as well as making changes to the UI to “reclaim vital space in the IDE.” For the curious, the full roadmap is available. And then, as for Visual Studio Code’s October 2018 release, Microsoft announced “a number of significant updates,” including multiline search, the inclusion of file icons in IntelliSense, better macOS support, collapsible stack frames, an improved Loaded Scripts view, updated extension samples, and CI recipe for extensions, among others. The most exciting of these features, it seems, may be the first mentioned — the ability to perform a multiline regular expressions search. For you VSCode users, make sure to click through to the blog post, as this just touches on what’s new this month. Oh, and one final note, Microsoft also separately announced this week that AI-assisted coding would come to Java with Visual Studio IntelliCode.